i did a deathless 11:59 speed run! first of all i loved the demo, i ll be sure to follow you , so that i can check the progress. Simple art and to the point. One question though , is the art vector based? What program did you use for 2d graphics? A lot of fun and shenanigans to be had with the Couch Co-op. The secret room after finding the bombs was a nice touch as well. I dislike the control buttons. Is there anyway to change? Wow, this game is great! Though, I feel the boss battle at the end was a tad too easy, especially in comparison with the escape sequence. Realmente eu gostei muito do game acho que tem um grande futuro,muitas partes me lembram muito dark sous ate mesmo nas os nomes das espadas muito legal,vi alguns bugs.Mas bem que vocês poderiam adicionar em um próximo update o idioma português brasil eu agradeceria muito. Re Logic : Oh Hell No! Calamity mod makers : ._. Thorium Mod Makers : Well i don't see a 100Ft Mechanical Worm. Sonic 2 : Well i'm out. Oh wow. Just... wow. This game takes old school side-scrolling beat-em-up cool and adds an awesome sheen of modern vibes! There's so many amazing aspects to it I don't really know where to start. Alright, here goes. Firstly, the art style is great! I love the character designs and the backgrounds are so nice to look at (I found myself getting distracted pretty often, not a great thing when there's so many things trying to kill you haha!). Next, the fighting and the fluidity of the controls and the different weapons and rechargeable item system all works excellently. It ties together so nicely and once I'd stopped being an idiot and figured out how it all worked (i.e. right at the end of the demo) I got a lot more enjoyment out of the experience. Finally, the side quest elements are something I know is going to make this game have so much replayability! When I finished the demo and was told there was more to see I was ecstatic! If that carries over into the full game it's going to definitely reel me in time and time again! I loved it a lot! Lots of fun! Reminded me of the all peaceful days when i was a child. Loads of fun! I am really looking forward to see the further development of Unsong Warriors! This is an extremely fun game. The movement is fluid, the combat is fast paced. There is a store where you can buy upgrades and equip your character to match your play style. My only gripe with the game is that jumping out of water is a little buggy. The feedback on getting out of the water we got more often. We're going to attempt to fix that in an upcoming version. Hey, can you make it possible to configure the buttons A and B for SNES controllers? It's the only gamepad I have and I can't configure those buttons, thank you. Wow, SNES, that's retro :). There are several connectors for SNES I see. Can you check if your controller is on this list? Well, probably it's a Tomee SNES USB Controller, it's the only incompatible with Windows. Thanks! 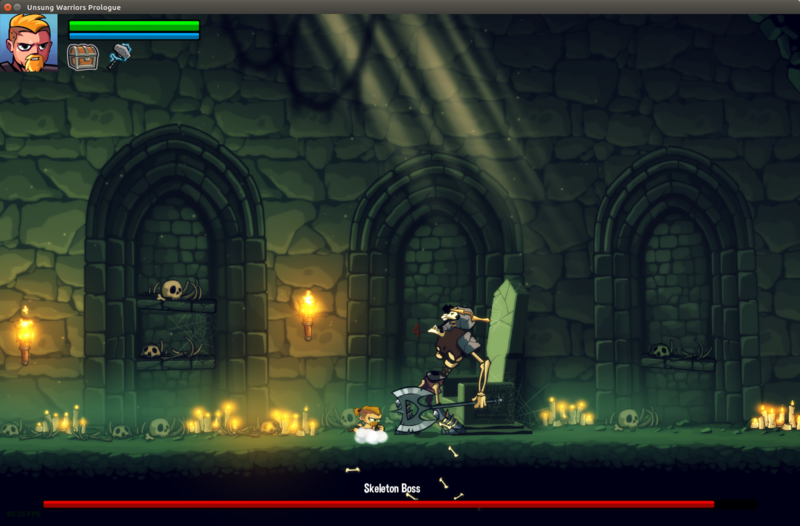 Be sure to check out the final bits of the crypt for a more metroidvania feel. Now that you have bombs, there is still a secret left to discover! Great game , tho I can't use the joystick of my Gamepad , only the D-Pad. I finished the crypt twice to buy all of the weapons , and had a lot of fun , I found the secret room "The name of the blessed will be reveal" , I also tried to translate the runic inscription on the gate but apparently , you inventend a rune the it's not a true runic phrase. Thanks for the compliments! Someone else was having the same problem, but then the other way around. Can you tell us what controller you have, on which OS? Hmm, that's quite an exotic combination :). We're using Rewired, which supports a lot of controllers. Unfortunately, not all controllers are known to be 100% compatible with every system. We'll update to a new version in the near future, hoping that that fixes it. Hmm, interesting, gonna see if we can reproduce that. What happens if you start the game? Can you still navigate your mouse? Thanks for the quick reply!. I can still move the mouse its just when I go to the settings, and click controls, it takes me to the audio, and it doesn't let me do anything else except carry on the game, where I have to esc to attack, which would be a bit annoying. I think I was able to reproduce this, we may have accidentally let you set a mouse key as a key binding in the game. Just fixed that, in the next update we'll ensure this cannot happen anymore. As for how to fix your situation... can you still use arrow keys and Enter to navigate through the menu? That way, navigate to Settings -> Controls -> check Keyboard and then select Set buttons P1 -> Reset to default. If this doesn't work, contact us directly and I'll think of a custom fix.